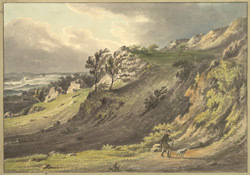 View of Undercliff in the Isle of Wight. Undercliff is the name given to a large stretch of the southern coastline of the Isle of Wight, protected by the peaks of St Catherine’s Hill and the Downs, which has a notably milder climate than that rest of the island. Undercliff extends from Luccombe to Blackgang Chine and a remarkable variety of plants thrive in the balmy environment making it a popular tourist destination for over 200 years. The warm sunshine and moist air here was acclaimed by 19th century Doctors who recommended the area to those suffering respiratory problems.